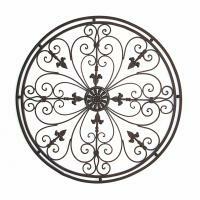 Metal and wrought iron wall grilles are a simple way to bring a Tuscan ambiance into any space. Wall grilles are metal wall decorations that are usually fabricated of wrought iron or bronze. They come in many sizes and shapes and will provide a great focal point for your room. Wall grilles bring a rustic and homey feel to any decor.